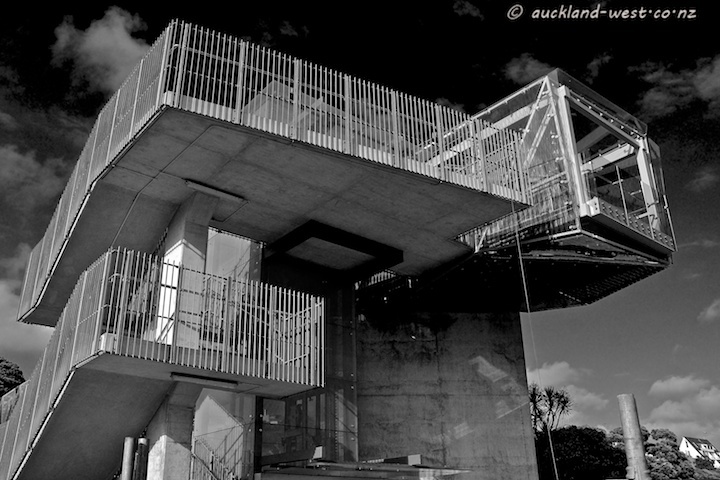 In the construction of the tunnel for State Highway 1 at the Fanshaw Street approach to the Auckland Harbour bridge, a new pedestrian bridge was built, allowing access from the heights of St Marys Bay via Jacobs Ladder to Westhaven Drive. Alas, due to unexpected problems with transparent panels, the opening of the bridge was delayed for the best part of a year. According to Phoebe Falconer of the NZ Herald, it will open today. This is the access from Westhaven Drive. Instantly I thought of a concrete sculpture of a crane! Impressive from this perspective! Great selection for monochrome. Love all the contrast. Wonderful collection of shapes and lines, all against that lovely sky!